I recently viewed a 4-minute YouTube video about fifteen-year-old Patrick Otema, who was born deaf. Patrick lives in a remote area of Uganda where there aren’t any schools for the hearing impaired. Patrick never had a conversation with anyone in his life. I can’t imagine not having the gift of language. What would 15 years of isolation, frustration, and unexpressed emotional need feel like? It staggers the imagination to contemplate. This video tugs deeply at my heart. In it we get to see the immediate change (almost, I would say, a resurrection) in young Patrick when he first starts to communicate with sign language. I have to admit that there are not too many things at this stage of my life that make me verklempt, but this touching film definitely brought tears to my eyes. I suspect that few would be unmoved by this young man’s story. Contemplating the importance of communication in our lives got me thinking: it’s not just hearing-impaired children who have challenges with communication and learning and who feel a sense of isolation. And while I am certainly not putting dyslexia on par with hearing loss as a disability, it is a life-long processing problem that requires a great deal of effort and tenacity on the part of the sufferer. What made the difference for Patrick was having a school and a teacher specifically tailored to his needs. A simple, positive learning environment set up specifically for the hearing impaired caused an instant change in Patrick. Adding a qualified teacher who understood first-hand the demands and isolation of his soundless, speechless domain was key to unlocking the mind and awakening hope in this young man. Profound lifelong isolation was replaced by a new life with new possibilities. He became part of a community, one with a voice and a new identity. Likewise, the dyslexic student requires certain accommodations to allow for the slower processing of educational material, as well as encouragement and support from knowledgeable educators and parents. Children with processing problems often feel a deep sense of isolation and even shame, not understanding their struggle for what seems to come so easily to others. In this part of the world, thankfully, schools are available to all, even those with very special needs like those without sight or hearing. However, the availability of schools does not preclude any child (especially one with processing issues) from falling through the cracks of the educational system. One of the most worthwhile endeavors parents can take on is school involvement. 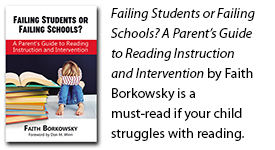 Are processing challenges suspected in your child? Demand an educational plan to address your child’s particular style of learning. Confer with teachers, counselors, and school administration to determine the best approach to your child’s education so that learning is optimized. Stay in touch regularly with the educational team to monitor for possible behavioral issues (a sign of frustration), avoidance tactics, or missed assignments. Such symptoms often point to areas that need attention. When dyslexic students have favorable learning environments, their quality of work goes up, and frustration level goes down. Accomplishing this requires effective communication between school system, parent, and child. Just like Patrick, all children need to find their “voices,” form their identities, feel understood, and feel like part of a community. Let’s all be as proactive as possible to help make this a reality.